PGG Wrightson Wool, along with partner Bloch & Behrens, has delivered a flagship brand to highlight the superior characteristics of New Zealand wool. Wool in the programme can be directly sourced as greasy, scoured or combed wool. Spinner brand partners are also able to provide manufacturers with Wool Integrity branded yarn suitable for a wide range of products. 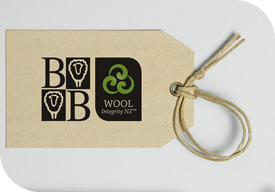 Wool integrity NZ provides assurance through the wool supply chain, and to customers, that the wool under its brand has been ethically grown, following a path of genuine integrity. Membership of the programme is free to wool growers.